Evanston Regional Hospital is an Area Trauma Hospital that offers emergency care services when you need them the most. With a physician available 24 hours a day, 7 days a week, our emergency department team is ready to assist you. In a medical emergency, every minute matters. At Evanston Regional Hospital, you'll find faster care in the emergency room. We work diligently to have you seen by a medical professional* in 30 minutes--or less. It is our 30-Minutes-Or-Less E.R. Service Pledge. View our average ER wait-times on our homepage. 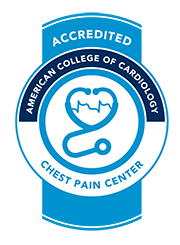 Evanston Regional is also the only hospital in Wyoming to be Chest Pain Center Accredited by the American College of Cardiology. This designation is a sign of our commitment offer you quality care when you need it most. *Medical professionals may include physicians, physician assistants and nurse practitioners.